Brace pattern, brace dimensions and shapes are crucial factors for guitar sound characteristics no matter the type of instrument. Transversal - primordial brace pattern - 3 transversal braces - can be observed inside of historic guitars. Imperfect system, counterproductive to the top plate vibrations. The cheapest guitars are transversal braced at present. Fan bracing - Torres (1817 - 1892) fan bracing is more often used pattern in modern guitar constructions. System is designed for nylon string instruments. It is rarely applied for steel string instruments. Very delicate bracing respects top plate oscillations. X - bracing - developed by Martin factory in the 1850. 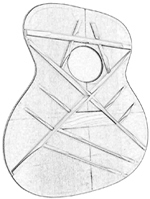 X - pattern is more often used in steel string instruments construction. Standard - full size braces with lite ends. Full strong less coloured sound, fewer harmonics. Very strong system, suitable for medium and heavy strings. Bluegrass and country guitars, mostly dreadnought type, 12 string instruments. Scalloped - Braces are unweighted without radical loss of stability. Full coloured sound with lots of basses and trebles. Suitable system for light strings. 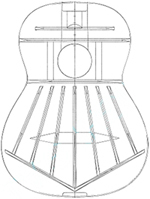 Scalloped bracing is very popular at present thanks to sound goodliness. Double X - Gibson modification of standard X pattern. Unsuccessful pattern - unstable nevertheless counterproductive to the top plate vibrations. X - bracing - very popular system during 30´. This type of bracing produces coloured mellow not so strong and loud sound. Usually used for acoustic arch top guitars. Parallel - very strong bracing system. Produces full strong very loud less coloured sound. Steadier system than X - bracing. Parallel bracing is the most often used system for its combination of good qualities. There are lots of experimental patterns used by luthiers. Listed systems are the most frequent brace pattern around the world.